Following is my letter to the Mayor of Bayreuth, Germany, who is being pressured to rescind an award to CODEPINK based on an accusation of anti-Semitism by a writer for the Jerusalem Post as a part of the State of Israel's campaign to discredit any person and any organization that dares to criticize its policies of apartheid toward Palestinians. Several other letters are included on the CODEPINK blog (with a link to the Jerusalem Post article). Many letters from Germans challenging the Mayor are being translated now and will be put on the website. I am a 29-year veteran of the US Army and retired as a Colonel. I also served 16 years in the U.S. Diplomatic Corps, in Nicaragua, Grenada, Somalia, Uzbekistan, Kyrgyzstan, Sierra Leone, Micronesia, Afghanistan and Mongolia, the last four postings as Deputy Ambassador. I resigned from the U.S. Government in March 2003 in opposition to my country's war of choice on Iraq. Since then I have been working with groups that oppose wars of choice and other illegal and immoral actions that my government and other governments are conducting. Challenging illegal actions of the U.S. Government is not un-American, and challenging illegal actions of the State of Israel is not anti-Semitic. We know from experience that members of both of those governments and their mouthpieces in the press will characterize such criticism of governmental action in the most negative and dangerously nationalist and fear-mongering manner to scare others from daring to challenge them. As you in Germany well know, those who spoke up against Nazism, the White Rose student movement with their statement "We Will Not Be Silent" were killed to silence them. The orchestrated campaign by the State of Israel to silence dissent about their brutal occupation of the West Bank, their horrific blockade of Gaza, their theft of huge areas of Palestine for illegal settlements, their continuing military attacks on the people of Gaza that have slaughtered tens of thousands, their massive apartheid walls and the imprisonment of thousands of the youth of Palestine for throwing rocks are actions that the State of Israel wants no criticism. But, we cannot be silent, particularly when the image of anti-Semitism is used to attempt to silence criticism. I resigned from the U.S. Government as public criticism of my government's action and I continue to be public in my criticism of actions of governments around the world when they are unlawful, illegal and/or immoral. I will continue to criticize the State of Israel until it stops these actions and policies. 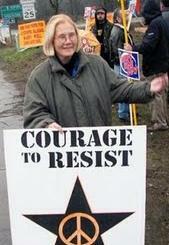 CODEPINK is much more than its work to educate about Israeli policies. Our work led by women to stop wars, end assassin drones, stop police brutality and end militarism has been a thorn in the side of governments and will continue to be as we will not back down from attempts to silence us.